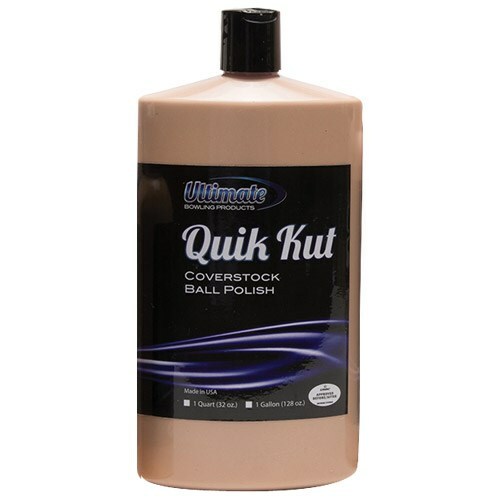 Ultimate Quik Kut and Polish 32 oz. When you don't have time to completely resurface a ball and need a quick fix, look no further than Quik Kut & Polish to get you back in the action with a new finish! Quik Kut & Polish is an easy to use one-step product equal to 500 grit sandpaper. Quik Kut will remove sanding lines from 220 grit on resin balls and take them to a 500 grit surface and polish at the same time. Quik Kut can be used on ALL new coverstocks to enhance performance. Due to the time it takes to produce the Ultimate Quik Kut and Polish 32 oz. ball it will ship in immediately. We cannot ship this ball outside the United States.